Bring on the bunnies for Easter! And don’t forget to bring on the dollar store for Easter bunny crafts and add a homemade touch to brighten up the Easter Basket this year. 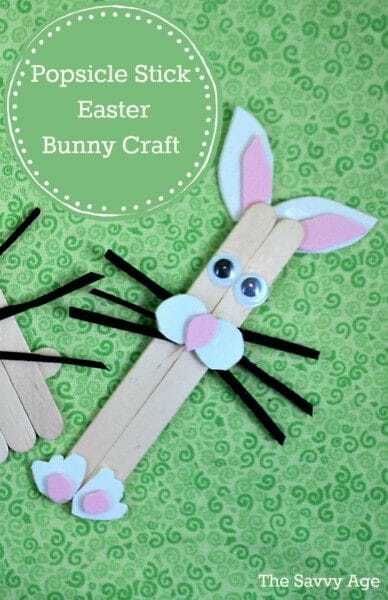 Check your craft supplies for most items and let the Popsicle Stick Easter Bunny craft for kids begin! 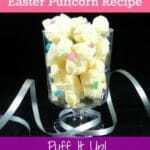 Are You Looking For An Easy Easter Craft For Kids? This Easter craft for kids could not be easier! Craft and popsicle sticks are inexpensive and easily bought in bulk for a classroom or after school project. The ears, nose and ears can be traced onto the foam paper for the kids to practice their scissor skills or can be cut freehand. This very easy Easter craft for kids is also a low key craft for grandparents and grandchildren to do together without much muss or fuss with the materials. 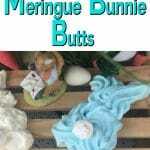 This is a very flexible Easter craft for kids or grandkids. Popsicle sticks work, but so do craft sticks! Either works. I have a stash of foam paper along with scraps of paper from prior projects, but felt or cardstock can easily be substituted for the foam sheets. 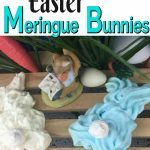 This little Easter rabbit can also be made in different colors by using acrylic paint to paint the popsicle sticks or even colored craft sticks can be used. Lay two popsicle sticks side by side. Glue or tape the sticks together. If using glue line the interior edge of one popsicle stick and press the edge of the second popsicle stick to the first stick. Make sure to use a clear drying craft glue. Cut out freehand the feet, nose and ears in white foam paper. Cut out freehand the interior of the feet, nose and ears as shown on the image below. Cut out the whiskers from black foam paper. Glue in the following order. Glue the white feet on the bottom of the popsicle sticks. Halfway up the popsicle stick glue the white nose. Now attach one white ear at an angle to each of the top popsicle sticks. You will be making a V.
Glue the pink inside of the bunnies feet, nose and ears to the already attached white foam paper. Glue the whiskers on to the sticks on each side of the nose. Your Popsicle Stick Bunny is now complete! It is important to use non toxic and clear drying glue as the popsicle stick craft is for toddlers and children. The bunny does not need to be “perfect” and of course you can use a pencil to draw the ears, nose and feet on the foam sheets so your child can practice their scissor skills. I use Weldbond glue for my crafts. Weldbond dries quick, is odorless, non toxic and is a very strong glue. I have used this glue on everything from wood to glass to tiles to everyday craft and DIY projects. The glue is white when first applied and clears as it dries, so no worries on your craft projects. Simply allow enough time for the glue to turn from white to clear and this is how to determine if the glue has dried and set. More Popsicle Stick Projects For Kids! Rock On! Paint Kindness Rocks & Smile! Absolutely adorable and oh, so easy! I love these bunnies!!! Perfect for an afternoon of fun crafting with kids.